6/1/13 - 7/1/13 | sweet juniper! When your kid breaks a bone, everyone wants to know how it happened. Like with divorce or some freak accident, there is a natural, selfish curiosity that surfaces when someone else breaks something: we want to know how, and why, perhaps so we might avoid breaking precious things of our own. Facing the inquiries, I feel for parents who break kids' arms on accident, swinging them around or wrestling in some playful moment that turns glee to agony. 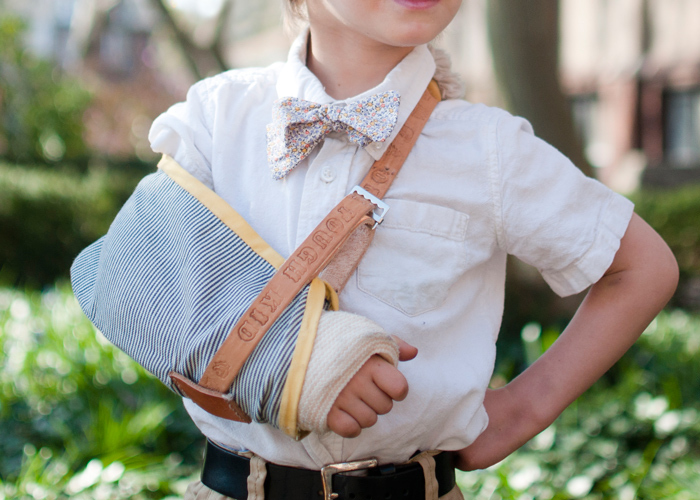 When a kid breaks his arm in this town, every doctor and every nurse asks the child what happened over and over, and as a parent you know what thin ice there is between you and a world of social workers and Kafkaesque bureaucracy, and you hold your breath each time when he answers. I was not even right there, so I was lucky, in a sense. I was free range parenting fifty yards away, letting the kids be kids on the playground without hovering over their every move. It is the natural lot of younger siblings, I guess, to be hovered over less, and to reach for things it seems you ought to be able to reach, like that metal bar your sister can swing her legs over to hang upside-down from. He fell trying to reach for something he couldn't quite grasp. When they carried him to me his arm looked like the neck of a goose in one of those hunting still lifes, slung over a velvet bag with a hare and a pheasant near a powder horn in brooding Flemish oils. With his sister screaming louder than he was, I gently slipped that fractured arm into the car seat harness and ran both red lights between him and the hospital. Hey, it's Detroit, where stoplights are little more than suggestions. So there it is: the how and the why, and now the sullen admission of failure. I should have been there. Should have been paying better attention. Should have stopped him. With every judgment-laden look from other parents, every time he gets frustrated by some simple task made near-impossible by that arm burdened with plaster, even when I see him playing one-handed as though nothing had ever happened, I feel like I may never mend. Before he broke his arm my son and I were running together a few times a week. He would follow me on his little bike and we'd have conversations the entire time. After he broke his arm, he couldn't ride that bike so we found the little roller contraption his grandpa gave him a few years ago and he transitioned to it with a natural grace that said nothing was going to slow this boy down. That thing wasn't fast enough for our May runs, though, so I pulled out our old jogging stroller and as I sweated and puffed he talked nonstop below me, and I grunted back at all the crazy, random thoughts that a five-year-old is compelled to share with his father. I have almost been grateful at times for that broken arm, how it tethered him a bit closer to me for just a little while. He's getting so big, and time is doing what it does best. It makes you grateful, to see your child broken just a little, if only for the reminder of just how delicate and tough you both are. A few days ago the cast came off, seven hours short of five full weeks (which was the shortest we were told it might take, but still seemed so long five short weeks ago). It haven't even updated this blog since it happened. It seems a five-year old's bones heal faster than I can be bothered to update a blog that's been around eight years. I am writing this now to remember it, to remember how we talked on our runs and how small his arm looked when they cut off his cast and how he raced around on that recumbent bike and how he hugged his dog with that heavy cast for five weeks sitting on his back whispering secrets in one floppy ear and how that whitemuzzled beast tolerated so much love bursting from his broken boy. I am writing to remember how we woke up cold on the day he broke his arm and drove to the woods with his viking costume and how we pretended the forest was a border of Jotunheim and the chill in the air was the breath of frost giants and how it was his job to drive them back to their icy land. 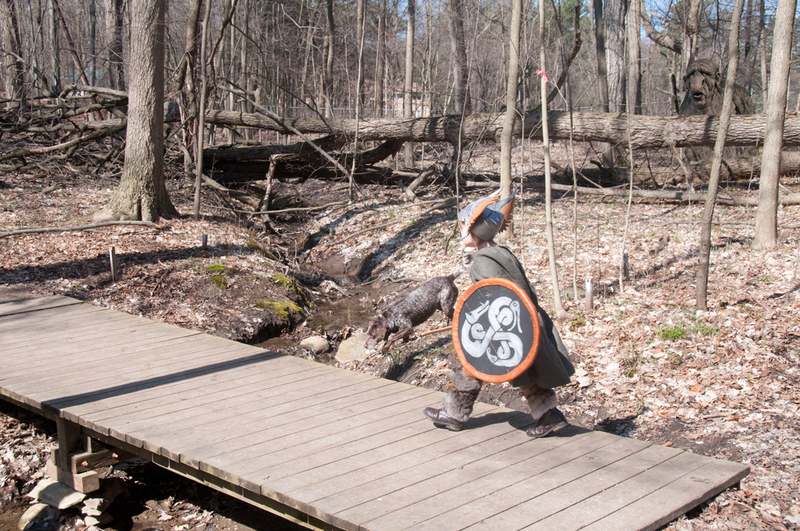 By afternoon it was warm and we'd driven back a hundred jotuns and he told me it was the best day ever and I will remember how excited he was just to play at our playground when we got home on the day he broke his arm. He told me later, delirious from the drugs they gave him, that it must have been a troll or a frost giant who cursed him and made him fall so I stayed up late that night photoshopping a few trolls into the pictures we took that morning. 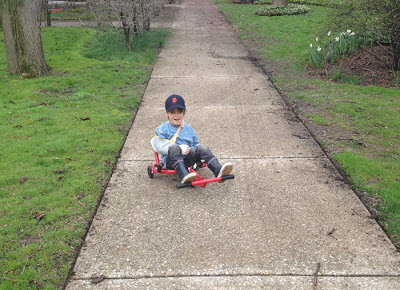 Yesterday he hopped on his old golden two-wheeler and pedaled behind me down the sidewalk. I slowed down so I could hear every word.